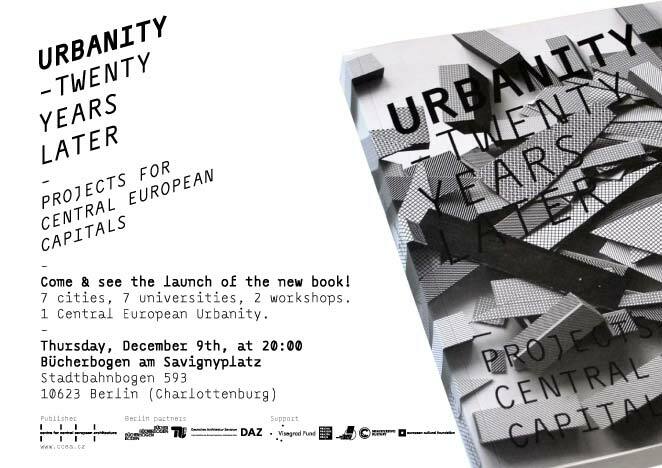 URBANITY Twenty Years Later is a research project, organized by CCEA, focusing on critical analysis of the transformation, which took a place within Central European region in the last twenty years. We share opinion, that there is a lack of communication and cooperation between countries within this region, which leads to the repetition of same mistakes. Project houses different activities from exhibitions in public space to lectures, student projects and conferences, round tables, symposia’s. Architects, politicians, photographers, anthropologists, sociologists and philosophers from seven European capitals /Berlin, Budapest, Bratislava, Ljubljana, Prague, Warsaw and Vienna/ are trying to point out their contemporary urban problems and develop a platform which would enable future cooperation between the cities and experts. The city is a mirror of social changes and their reasons. But what does the national capital mean in today’s Europe? What is the representation of power in cities today? How have Central European capitals changed under the power of the transforming structure of society? What was the effect of the changes which happened in the last twenty years? What is the role of an architect nowadays and who decides about the city? URBANITY student projects are focusing on developing new concepts for Central European capitals, which would be flexible enough to take into account the different speed of social, demographic and political changes. URBANITY large scale photographs in busy public spaces should activate the public and question the negative impact of contemporary development strategies and tactics. The outcome of our interdisciplinary research teams /architects, artists, anthropologists, historians, sociologists, politicians, photographers/ is going to be a publication URBANITY Twenty Years Later which will be published in English in autumn 2011.